"Missing" sidewalks are an obvious and dangerous condition for pedestrians. Recently developed city and county codes usually call for sidewalks on both sides of the street. 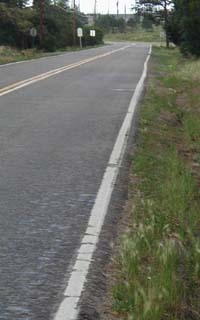 In some cases, wide road shoulders may substitute for sidewalks; in any case, there should always be a safe walkway, buffered from the road. Roads like the one shown in these pictures invite disaster. The roadway design was obviously focused only on vehicular traffic, not pedestrians. The only comfortable place to walk is on the road, which is unsafe. To avoid walking on the road, the pedestrian must walk on the uneven surface of the roadside drainage. Pedestrians on roads like this are advised to take precautions, as well they should: walk facing traffic, wear bright (preferably reflective) clothing, carry a flashlight at night. We mustn't forget, though, that people make mistakes. When drivers make mistakes and are involved in a crash with another vehicle, the result is most often a "fender bender", with no serious consequences. 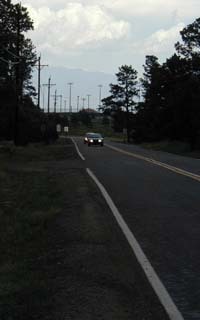 When one of the parties to a crash is a pedestrian, the result is usually serious injury or death. Drivers are protected by tons of steel; pedestrians need to be protected by adequate sidewalks.